Miami Hurricane Shelter Still Packed - With People And Pets Even as Miami returns to normal, an emergency shelter continues to take in people every day. 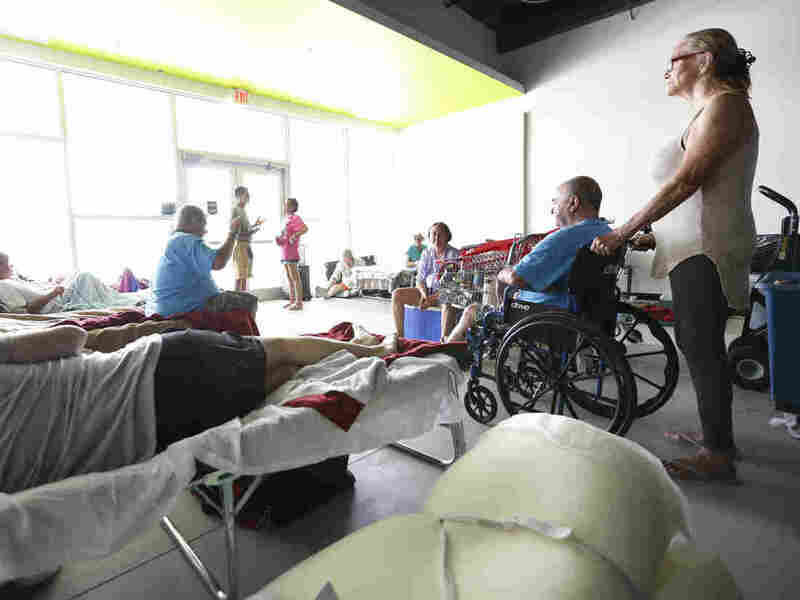 Evacuees at a special needs shelter sit and chat or rest, Thursday, Sept. 14, 2017, at Florida International University in Miami, Fla. About 30 people, including staff with the Florida Keys Outreach Coalition for the Homeless from Key West, Fla., were sheltered in a storefront underneath a parking garage on campus. Miami's largest hurricane shelter, run by the Red Cross, still houses nearly 1,000 people. Some have been there since before the storm but many are recent arrivals—people who tried to ride out the storm but are now dealing with an ongoing lack of power and mold infesting their homes. As of Saturday, 866 humans are staying in the Costco-sized warehouse- - Miami/Dade Fairgrounds shelter — packed with cots, overflowing bags of donated clothes and mountains of bottled water. The oldest is 105 years old. The youngest is 1 day old. Then there's the non-humans. We're talking pets. Eighteen dogs. Six birds. A monkey. And two cats who evacuated from the Keys. "Yeah, these are my boys. This is Angel and that's Rimsky," their owner says fondly. She's Athena –no last name—who was working as a life coach in Ramrod Key before the storm. Athena's set up something like a fortress around her cot using the cat cage and folding chairs draped with pink towels for privacy. And now, because she uses a cane, Athena's chatting with a disability activist who's been going around checking in on people with special needs. "Toilet paper has been a huge thing," she says. "The day after the hurricane, we ran out of toilet paper and had none for 24 hours and it's been spotty and they've been trying but it's just little things." Toilet paper is a low tech little problem. Lack of wifi is a high tech one. Not having it makes filling out FEMA paperwork a total headache. The activist, Ernie Martinez, heads over to shelter manager Louise Vandewiele to amplify these concerns. She's more than willing to listen. She and Martinez have been in constant contact. Making sure there are nice, wide aisles for people in wheelchairs. Getting help for a blind person counting steps. Segregating people with allergies from the pet-friendly part of the shelter. Dealing with a deaf veteran with signs of PTSD. Vandewiele says she absolutely understands the toilet paper issue. "You know, with 1,000 people, which is what we'll have by the end of the day, we use up a lot of it," she says wryly, noting that the shelter tries to make sure everyone can hang onto their own individual roll. Vandewiele came from Tennessee to run this shelter for two weeks. She's a 57- year-old Red Cross veteran who started volunteering in her 20s during ice storms in her native Canada. She's a mother of 10 children, many of them adopted foster kids, with her husband, an emergency room physician. Vandewiele's shelter in Miami is consolidating as others shut down. But it's also taking in new people who've spent the past week in motels or hotels — but now they're out of money and they can't go to their uninhabitable homes. Or there are people like 24-year-old Tyler Gist. "I've been here since Monday," he says. "I came from a different shelter --Miami Central, they moved us all here." Before Irma, Gist was living in a rescue mission. He'd just moved to Miami, and was robbed on his way here, he says, of $1800 in cash. Lanky and bearded, sporting a white T-shirt and a spider-web elbow tattoo, Gist spent the past week helping out at the shelter. He passed out water, assisted old people, built cots, but then he got bored. "Eight in the morning yesterday, I started –I was walking up and down the road even though it was exhausting hot," he says. "And I found a job within four hours." A job delivering sandwiches at the Jimmy Johns chain, but the guy who offered it said he needed a bike. "And well, I kind of lied to him and told him I had a bike," Gist said. But he went back to the shelter, determined to make this work. "Sometimes you got to bite your tongue and do things that you don't feel like is necessary," he said. "I don't like asking for stuff." Gist was near tears. But that's exactly what he did. Later that afternoon, when a family dropped off clothes and toys at the shelter, Gist approached them with a question. "If you know anyone who has a bike that they could donate it, it would be highly appreciated. I really need one for my job," he said quietly. Two hours later, the dad came back with a bike. To be clear, Gist has a bike now, but no lock and no helmet. He's not sure how he'll piece together what he has left after Irma. But like so many people at this shelter, he says having anything after the hurricane feels like a blessing.